You can get a great feeling of the meeting from the perspective of the 120-strong attendance (our highest ever) by looking at our #SpokesMtg twitter hashtag. *For this and other comparisons between 1977 and 2017, see the table on page 1 of our anniversary supplement. Moreover, in 1977 road danger was largely seen as an almost inevitable part of life, whereas now it is seen much more as something that we can and must tackle – and this concern has grown as the huge long-term decline in serious road casualties has flattened out in the last few years. 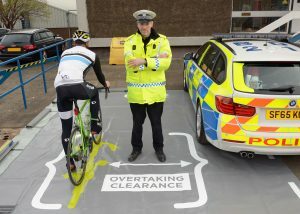 PC Dominic Doyle described Operation Close Pass in which drivers who pass an unmarked videocam-equipped police cyclist too closely are pulled over and given advice – using a specially designed mat which shows how much space a person on a bicycle needs when being overtaken. #OpClosePass is currently running only in our area, but it is hoped to roll it out elsewhere in Scotland. 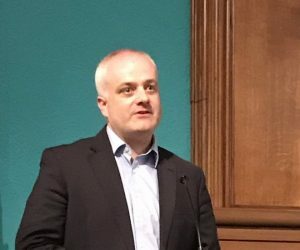 Dominic’s presentation slides are here. The final slide includes some useful video links. He also mentioned that the police would look at video footage of dangerous overtaking submitted by members of the public. Spokes has published advice on how to submit such evidence – see page 8 of Bulletin 128. and we also have a webpage on road policing. Dr Caroline Brown of the Urban Institute at Heriot-Watt University described her work on the particular dangers posed by large vehicles, the reasons for them, and how danger could be substantially reduced by truck redesign, infrastructure changes and driver training; and how such measures could be speeded up by public sector (and other) procurement contracts and other means. Caroline’s presentation slides are here. Mark did not use slides, but points everyone concerned to the consultation website. On the website, listen to Mark’s video introduction, read the consultation document and then complete the survey. Closing date 15 September [was originally 7 August]. 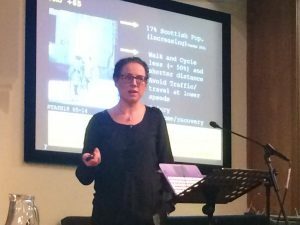 Suzanne Meade … of Edinburgh Napier University’s Transport Research Unit outlined her detailed research into how road danger affects vulnerable road users (VRUs) of different ages and in different contexts such as urban/rural in different ways. Urban adult commuter cyclists had seen a particular rise in serious injuries in recent years – one of the few areas of public health where the more affluent have suffered most. 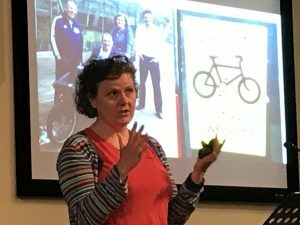 She pointed to Seville where a rapidly installed segregated cycle network had resulted in rapid cycle use growth and a 50% reduction in serious injuries per distance cycled. Suzanne’s presentation slides are here. 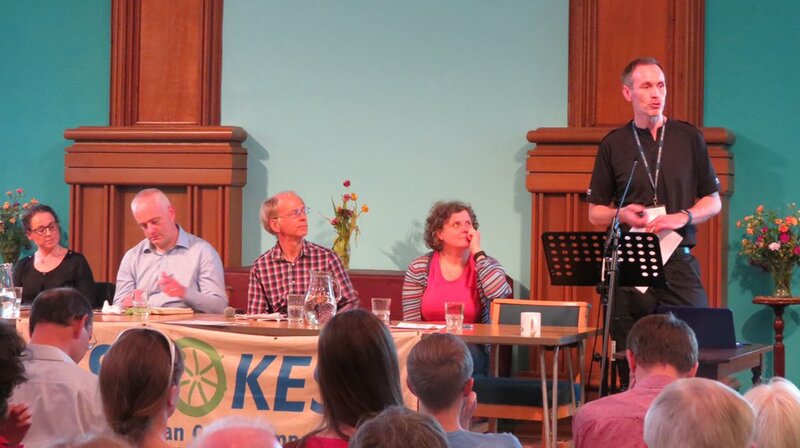 Unfortunately we did not take notes, but there was the usual well-informed and instructive 60-minute Q/A with audience questions to the panel of speakers, chaired by Kirsty Lewin, Spokes member and trustee of Sustrans UK. Some of the points raised are covered by the #SpokesMtg tweets. Uncontrolled junctions (i.e. give-ways rather than traffic lights) are one of the main hazard locations – redesign or adding traffic control are the real answer – and police resources are in any case limited. Please RT our tweet of this report! 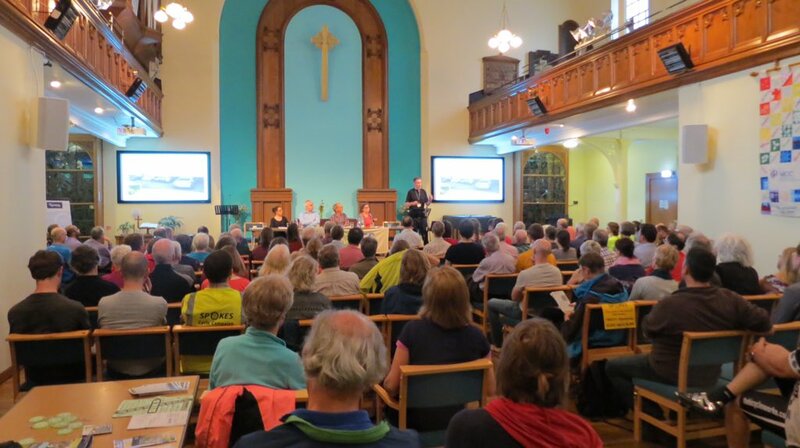 The meeting was one of our two contributions to the wonderful Edinburgh Festival of Cycling. See also our Bike Breakfast report.